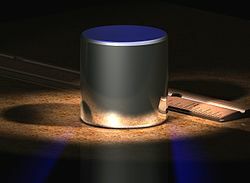 A computer-generated image of the international prototype kilogram (IPK). The IPK is the kilogram. The IPK, which is roughly the size of a golf ball, sits here alongside a ruler. The IPK is made of a platinum–iridium alloy and is stored in a vault at the International Bureau of Weights and Measures in Sèvres, France. Like the other prototypes, the edges of the IPK have a four-angle chamfer to minimize wear. For other kilogram-related images, see External links, below. කිලෝග්රෑම (සංකේතය: kg) යනු මේට්‍රික් ක්‍රමය මත අධිකාරී බලය දැනට දරන්නාවූ ඒකකයන් සඳහා අන්තර්ජාතික ක්‍රමයෙහි ස්කන්ධය සඳහා වන පාද ඒකකය වෙයි. උපුටාදැක්වීම් දෝෂය: "Note" නම් කණ්ඩායම සඳහා <ref> ටැග පැවතුණත්, ඊට අදාළ <references group="Note"/> ටැග සොයාගත නොහැකි විය. මේ පිටුව අන්තිමට සැකසුවේ 27 ජූනි 2013 දින දී, 11:35 වේලාවෙහිදීය.